Location of a WW2 HAA Gun Battery at Hedon, designation number C1/-. Location of a WW2 'Y' Station, a Top Secret listening post for intercepting German messages. The records were sent on to Bletchley Park. A collection of army tanks awaiting shipment? Empty gun position on the stern of the ship. Tram depot, now used by a company building caravans of all sizes. Please notice the "odd pole" adjacent to the Graving Dock signal box. I believe to place the box where it was the telephone wires have been moved to the north to give clearance. 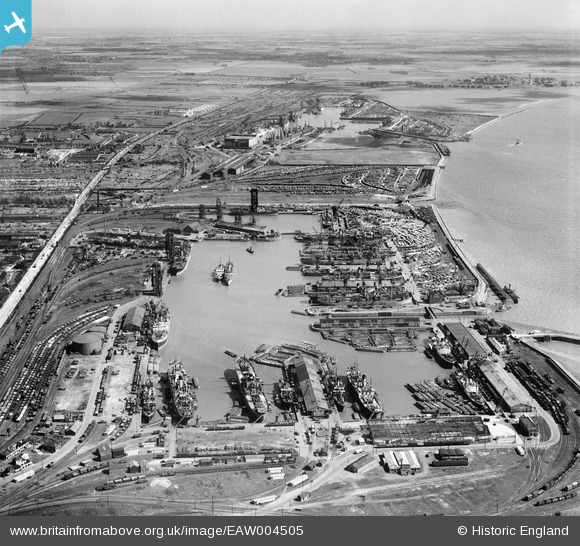 "Graving docks" used for ship repairs by "Brigham & Cowan" directly opposite across Hedon Road. Their staff arrived on site via a tunnel under the railway. The docks are still in use to-day but now with a cover over them for the import of high grade steel. Wood carrying "bogies". Just a basic frame mounted on two axles for transporting timber around the dock complex. Three of many air raid shelters provided by the dock company. Site of a turntable, used for turning passenger locomotives using the one time station here. The station was intended to take over the tram traffic along Hedon Road but the Hull & Barnsley company wasted their money.